The flavors of this Apricot Balsamic Chicken are absolutely divine – sweet, tangy, salty…it’s truly mouthwatering. The chicken breasts are seasoned with salt, pepper, and fresh thyme and sautéed quickly. Then they are topped with the most delicious apricot balsamic sauce, that will have you licking the spoon. A bargain at just 5 Points, this Weight Watchers Recipe tastes way too good to be true. It’s a quick and easy dinner that can be prepared within minutes, and involves no prep work. It’s become my new favorite chicken recipe! Enjoy. 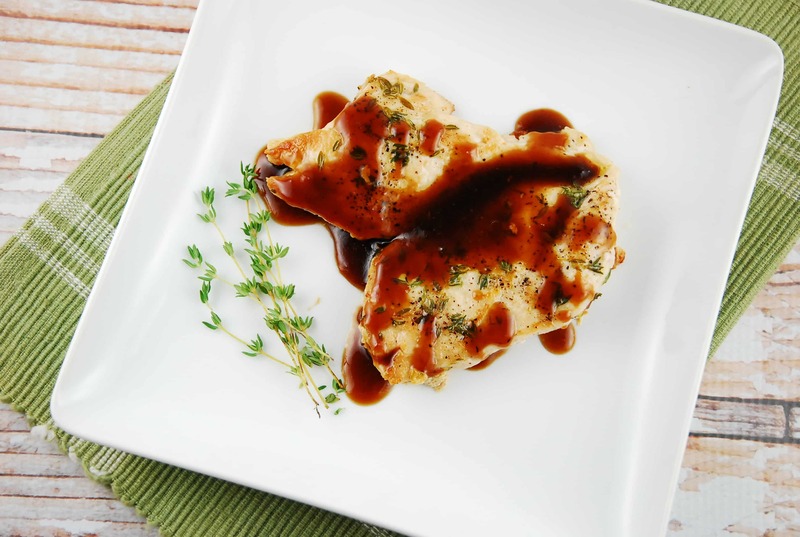 A simple chicken dish become elevated with the bold and decadent apricot preserves and balsamic sauce. Sweet and tangy, the sauce is a perfect complement to the thyme seasoned chicken. Mist a nonstick skillet with cooking spray or an olive oil mister and set over medium high heat. Season chicken breasts with salt, pepper and thyme. Add chicken to pan, and cook for about 5-7 minutes on each side, or until chicken is cooked through. Remove chicken from pan, and set aside. Lower heat to medium, and add apricot preserves and balsamic vinegar to pan. Stir constantly until jam has liquefied and sauce is well heated. Plate chicken and spoon sauce over it just before serving.